I have to admit I’ve never been a fan of binding. I love piecing tops and I love the gratification of quilting the top. But the thought of binding makes me cringe. In fact, I dislike it so much that the quilt I made for my mother wasn’t even finished. I gave it to her along with the fabric she needed to bind it! Looking back, it probably wasn’t the nicest thing I ever did but I was intimidated by the whole binding process. I’m much more confident now in my ability to bind a quilt and I even hand stitched the last one. That in itself was a miracle. This is my first hand sewn binding! The gorgeous Princess in the picture is my 14 year old daughter. 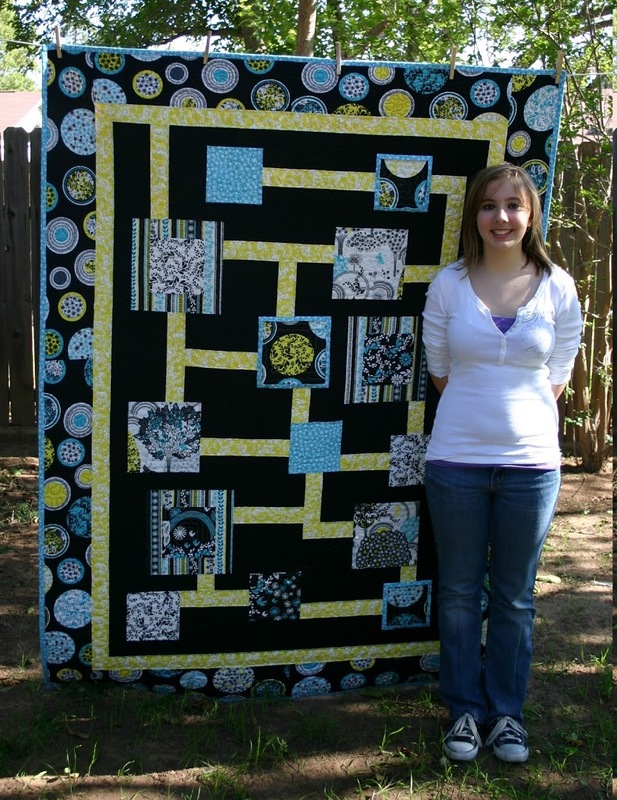 She designed this quilt! I’m so proud of her. 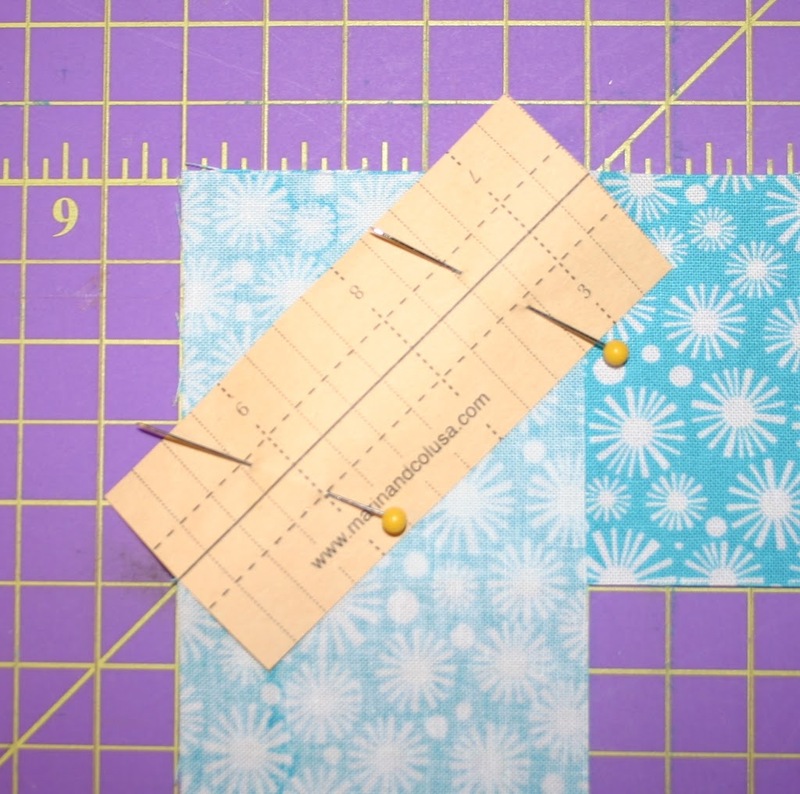 I’m going to show you how I joined my binding strips in this tutorial. Attaching it to the quilt and stitching it down will come later. I always join my strips on the bias because it’s less bulky and I just think it looks nicer. So, that’s what I’m going to show you….my preferred method. 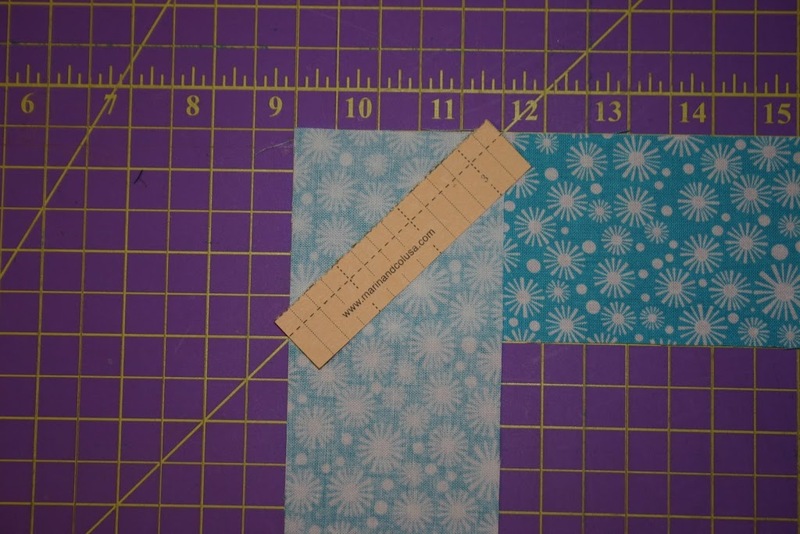 First, I cut my binding strips. 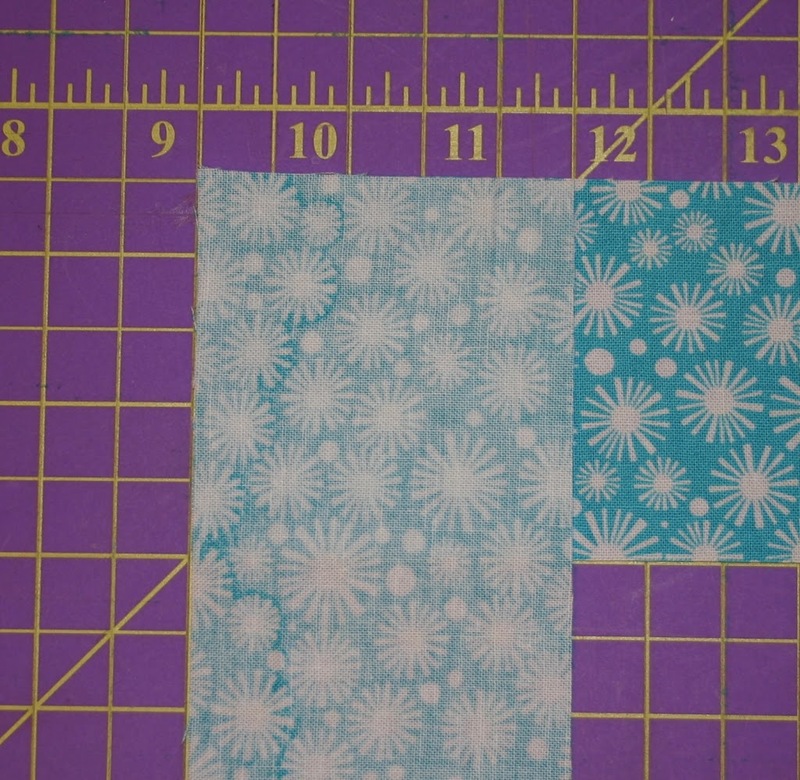 In this case I needed (7) 2.5″ strips. I laid the first strip right side up on my cutting mat. I lined the strip up so that the 45 degree line was lined up with the bottom left corner of the strip. See below picture. 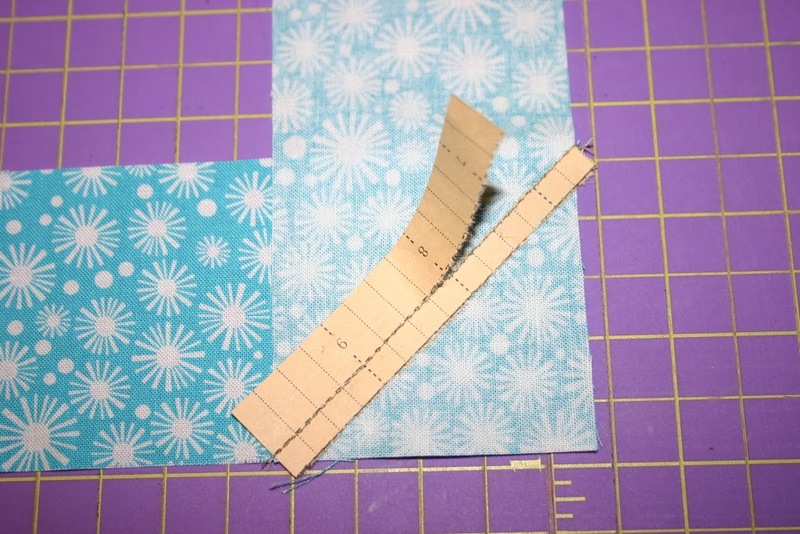 The second strip will be perpendicular to the first strip with right sides together. Now, here’s where I do things a little bit different. I hate drawing lines on fabric. I never do a good job because the pen always gets stuck and I have to drag it along. It just irritates me. So, I found that I really like using Marin & Colusa Stitching Lines. The beauty of the stitching lines is you cut them to the size you need. I just happened to have some leftover pieces from a different project that worked perfectly for this. My scrap pieces were 3.5″ long, the perfect size for my binding. I simply laid the stitching line across my fabric. You can see the solid black line is matched to the 45 degree line on my mat. I pinned the stitching line in place once it’s lined up. Pinned in place ready to sew! Now, I just stitched right down the line. I did change my stitch length to 2.0. After it’s stitched, I rip the paper right off. I did not throw the stitching lines away! I can still use each side. I keep both of these pieces. I will use each one for joining more strips. Now it’s time to trim and press. 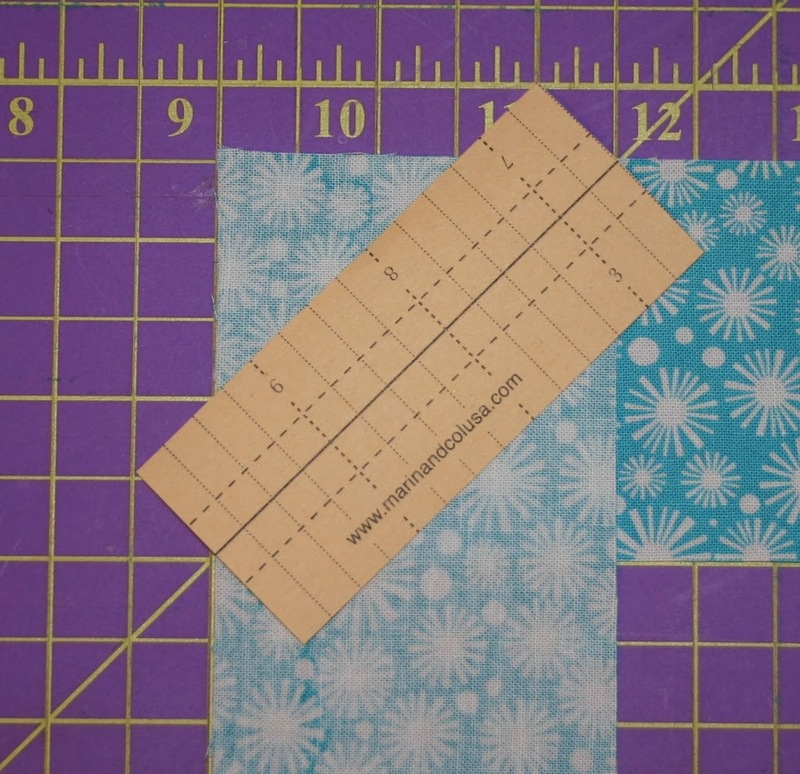 I placed the 1/4″ line of my ruler on the seam and trimmed off the excess fabric. Remember those little pieces I ripped off earlier…it’s time to use them. I found the end of the strips I just joined and started over. I placed the end right side up on the cutting mat and lined it up with the 45 degree line again. I put strip number 3 perpendicular with right sides together. 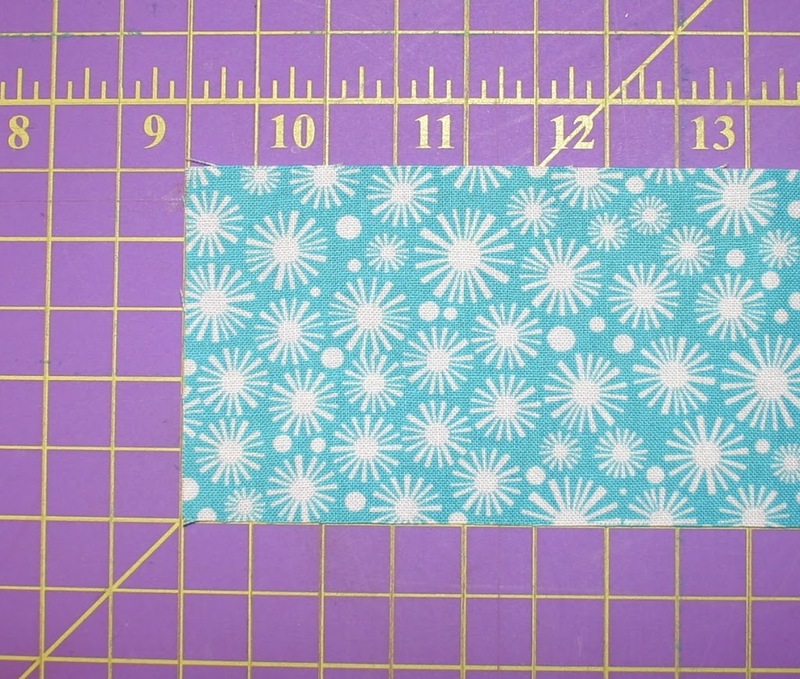 This time I lined up the dotted line of the stitching lines with the 45 degree on my cutting mat. Pin it in place, sew, rip paper off, trim, and press. Now it’s time to throw away the paper. I used the Stitching Lines the most efficient way! I continued with this process until I had all 7 strips joined together. Once they are all joined I pressed the binding in half lengthwise with wrong sides together. My binding ended up being 1.25″ x 280″ (approximately). Now it’s time to put it on the quilt…but I’m saving that for next time. 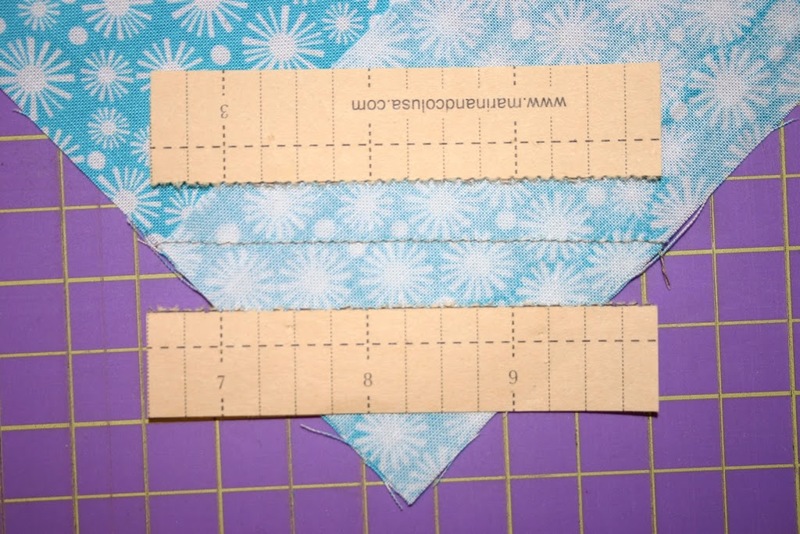 I hope you enjoyed seeing how I join my binding strips. I really like using the stitching lines for this because I hate drawing on fabric. 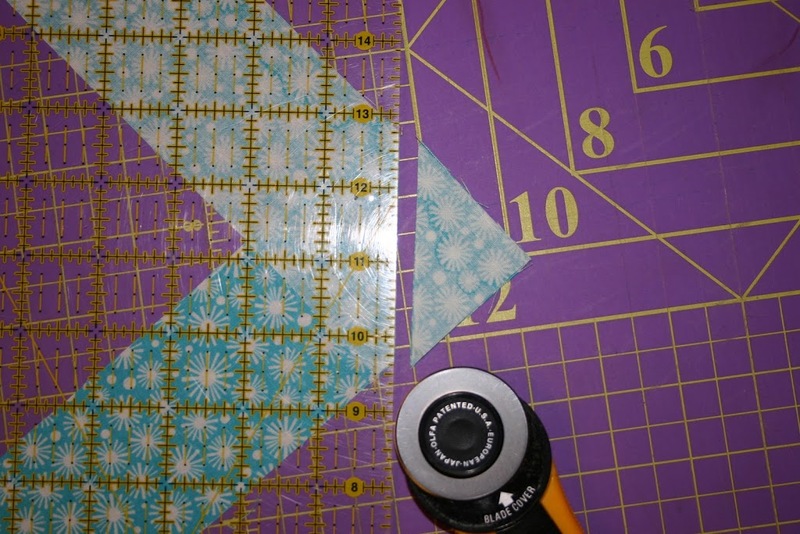 I did forget to mention that the Stitching Lines are also a great tool for making half square triangles. The great thing is you cut them to the size you need. And if you’re into saving money you can use them several times just like I did. Just remember, there’s always more than one way to do something, especially in quilting. 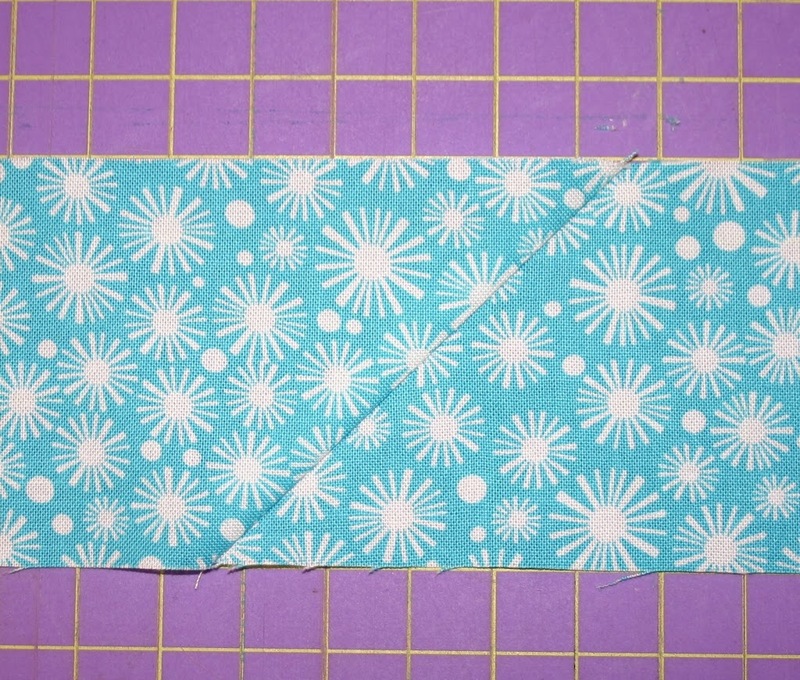 This is certainly not the only way to join binding strips, but it is my favorite way. As always, leave us a comment and let us know what you think. 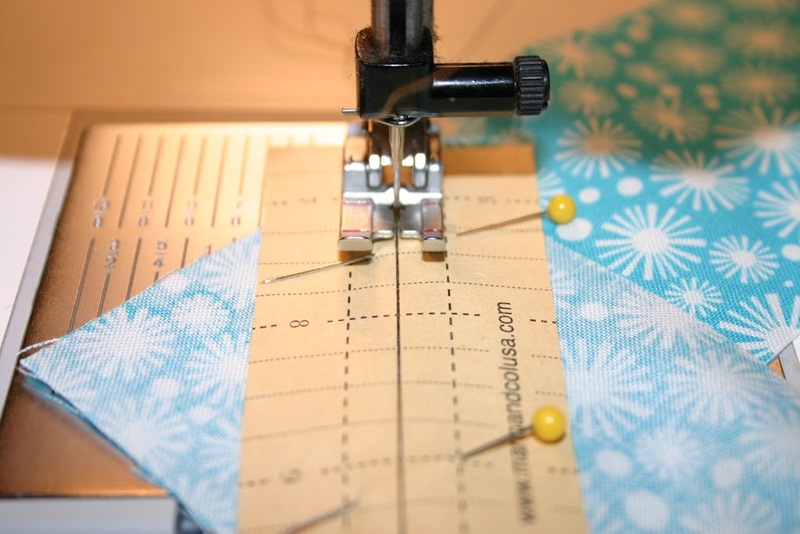 Have you used the stitching lines? What did you think? I just found your blog this morning. It’s a lovely spot to stop and visit. I am thrilled that you like my Stitching Lines. I, too, use them to sew together binding strips. I posted this week on another way to use up the leftovers. Binding is my least favorite thing too. I have never heard of these 95% of the time I can eyeball my seam……5% has to be redone. Thanks for sharing the info and your daughter made a beautiful quilt design! Great use and I’m enjoying discovbering your blog. I now follow! Thanks Quilt Hollow! I just love the stitching lines! I just came across your blog. I have always had problems getting my strips to line up when I have made my bindings. I have come across the Stitching Lines but maybe I can make up something just as useful. Again, thanks for you tip!